The ‘Walking Shoe’ label of the New Balance Men’s MW928 shouldn’t be mistaken for giving specific use. They are multipurpose and definitely the best walking shoes for men with huge application in our daily routine. The Walking Shoe label emphasizes the fact that the shoes are ideal for daily use by giving your feet utmost comfort by putting no stress on them at all. New balance has never compromised on the quality, looks and ease of use along with the quality and longevity of their products. This one is also reasonably priced and offers quality walking experience. 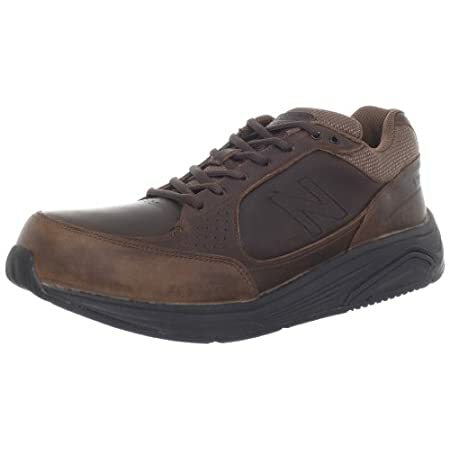 New Balance Men’s MW928 comes with a well-designed and rugged overall look while giving a comfy rest to the feet for an easy walk. To give an excellent overall look, the shoes has been given a design that makes it perfect for casual use, and due to its comfortable interior, it is best for a regular walk. ​Stabilizing ROLLBAR technology used for the manufacturing of the shoes. ​The materials that are used in the making of the shoe are of imported quality. You can be sure of having a high-quality shoe that is made of imported materials and ensures to be based on international standards of quality. It has a leather upper made of high-quality leather with complementary patches of mesh fabric and cushioning at the back, New Balance logo on the medial side and lace up vamp for a perfect fit and easily put on capability. In addition to the leather materials, the shoe has mesh lining fabric and synthetic rubber sole as well. ​The shoe is purely a walking shoe. It provides a comfortable foot accommodation to make sure you will feel easy while wearing and walking. So, it best for regular walkers and athletes who need a reliable and stable foot support throughout the distance they walk. ​The interior is well designed to make sure your foot arches and mounts stay balanced and comfortable and will have no pressure on the foot muscles. There is a specially designed Roll Bar technology introduced in the shoe to give the interior a specific lift to keep the foot in an easy mode and help in transitioning the foot position while walking. ​The ABZORB cushioning in the midfoot region helps in absorbing the shock and pressure that may affect the foot and cause fatigue in the muscles. In this way, your feet stay easy and is not affected by such forces and let you walk for miles after miles. ​The collar, the back, and the whole interior are properly cushioned to give enough comfort and support to the foot so that it never slips or turns and the foot stays embedded in the shoe. ​The outsole is made of synthetic rubber that gives a stable support to the feet through its well-designed surface that keeps the foot in place while walking on any kind of surface, whether it's rough surface or a slippery place. The shoe is very easy to use when you put it on and walk with it. You can easily adjust the shoe with the help of the laces, and the shoe will fit according to your foot size. Some people say that the shoe may not last for a long time due to some issues with the leather materials, but it’s a great substitute for your money. The shoe has a supportive structure complimented by the Roll Bar feature that enables you to have a comfortable walk without getting fatigued or developing pressure points. The insole and the outsole are well structured to give enough support to the arching points and keep the foot in its best posture so that you stay stable and easy while walking. Due to the presence of ABZORB cushioning the shoe provides an easy walk through shock absorption and keeping the pressure level at the least. The odor resistant liner makes it sure that you don’t develop sweat odors and your foot will stay fresh and well ventilated. ​The best walking shoes for men should have got comfort well above everything else. Comfort is always the prime concern of New Balance manufacturer and they have always lived up to their expectations and standards. The MW928 shoe is nothing short of excellence as far as comfort is concerned. It uses the ROLLBAR and ENERGY technology to ensure a comfortable﻿﻿ feeling of the feet. The walking strike outsole is specifically designed for men to give them the opportunity of always having a comfortable walk.